Jen's retainer clients range from small and mid-sized Brands to multi-million dollar publicly-traded companies and everything in between Jen is also the Creator. Of press success APR master class for entrepreneurs to learn step-by-step framework for executing a PR strategy that converts in a massive media placements for their businesses and the agency accelerator where she teaches the exact strategy launch grow and scale a profitable PR and marketing agency in just about eight weeks. So prior to founding generation PR in 2005. Jennifer was a lawyer and practice civil litigation at. Stages law form then she eventually saw the light and started her own business and decided to pursue creative Endeavors. She's been featured on New York Times Forbes. Ink.com Business Insider The Huffington Post and many other well-known media Outlets. So welcome to the podcast Jen you have quite a resume. That was a mouthful. Thank you so much. Thanks for having me. Yes, you're not not a problem in this episode. Of course, we're going to be talking about a lot. I know a lot of what you're familiar with which is public relations. As well as influencer engagement, but before we get into that, I'd like to tell you I'd like you to tell us a little bit about your background as I know you've really done a lot and I'm really always impressed by people that have such a diverse background. So I want you to let us know how you got into what you're doing today. Yeah, it's kind of a not so obvious transition starting out as a civil litigator, right and then shifting into PR, but it's my path. It's my story in it. It's been just. Awesome for me. I practice law here in Los Angeles for about four years. I was at a big law firm and it always for be felt more like a job than a career just felt like this kind of path that I was on. I was just kind of showing up every day doing the work but never really felt like it was the right fit for me or my personality and I just always had this really strong entrepreneurial pole and you know kind of grew up or my dad has had his own business. Yes, and really loved having my parents around when I was a kid, you know to take me to art classes and you know do homework with us after school and I started to really think through what my path would look like if I ended up making partner at a big law firm and you know, ultimately got married and had kids. And I just really realized that that was not going to be the right path for me. And I looked around there were no women that had the life that I was looking for, you know, they would have kids and these are not come back or they would have their workload cut significantly and kind of not be taken as seriously. So I saw the writing on the wall and realized I had to Ghana Forge my own path and I just had this really strong Pole to the beauty and cosmetics industry. And baby and kids and I could see products that I loved and that I used and have a really Clear Vision for how to promote them and I just actually started promoting a brand on the side fragrance company that I found in Europe on my bar trip of all things then several years later. I was getting ready to buy this product again. I couldn't find it anywhere and I did a little internet research and kind of realize the company with this amazing products. Eastern California, but had no presence in retail and no presence online and no, you know, no media mentions when I reach out to the company. I just said can I help you? And you know, I started working for them for free just on the side while I was practicing law and I loved the work so much that I started to think if I can actually get paid doing this it would be. The best career ever getting paid to do what you love that you're willing to do for free, right? Yeah for sure for sure. That's that's always the best way to go and that's that's that's quite a story and it's really impressive that you were able to get into something that you really loved and are passionate about and there's a couple key takeaways that I actually want to point out before we move further one of the things that really stuck out to me that you mention that I think a lot of start startup businesses or young. Preneur struggle with is when they go into a particular niche. Of course, you said you were going to be going into the pr space but rather than saying OK I want to be a PR firm that you know deals with all types of businesses. I'm going to take any business that comes my way no matter what industry no matter what type of business or service off. You know, what does it matter? I'm going to do it for you, but rather than kind of staying so broad like that when you decided to do was. You said you had an affinity for you know, baby products Health and Beauty space and you decided to stick with that route. So you had a more narrow Focus early on and I think that's something that I'm sure has helped you out because you didn't spread your net so wide and you know kind of have a hard time figuring out really what what things that you were really good at. You just knew you had an affinity for that type of product those types of companies and you just honed in on it. So. Definitely something I think you know really Rings true to what you said. Yeah, and and it's such a great point. I really realized that developing a deep expertise and those areas has allowed us to establish really solid relationships with the media and such a deep understanding of that industry that really translates into I mean for us it's a solid reputation in those in those areas and we attract really premium brands. Rate well-known International companies with that's where we've been able to Pivot and support billion dollar Brands is you know, rather than being a generalist if you develop a deep expertise in a certain Niche, you know, it's like they say the knit the riches are in the niches and we've been able to charge premium rates because we are kind of sought after in those various areas and then it's like you're saying at other companies come and they're kind of outside the realm of what we. Love and what we're great at, you know, I'll be the first to say it's not the right fit no matter how no wonderful of an opportunity if we can't best serve them with what we are the best at then we, you know, don't pursue those opportunities. Right? Right, and that's that's something that's really hard to do. Especially early on is to turn away business to say. Oh, yeah, you know even though. Were young we may be struggling? We need all the business we can it takes really a lot of guts just say no that's not our area of expertise. We would rather, you know, focus on you know, what we're good at then, you know, those are the things that those are the areas in which we could help you out. So that's that really makes total sense. Yeah, and I just couldn't keep your point. That's what I teach in the agency accelerator to because I work with these people starting agencies and they're like, you said, you know, someone's got a paycheck they're in business. I'll take that work and they start to go down a path where they're unhappy with the work they're doing and they're attracting their less than ideal clients. So, you know, it's very very hard to turn down work. But when you start to have a vision of the kind of business you want to build and you really stay dedicated to that you can you know, kind of really Forge your dream for depass towards your dream business and not get sidetracked and you just start to grow bigger faster when you're very clear on your vision. Yes, that's that is a hundred percent true for sure. Now, you know a lot of the listeners to this podcast our e-commerce businesses or e-commerce marketers people involved in the marketing of e-commerce businesses. And you know, of course your bread and butter is public relations. So how exactly would you say the average e-commerce business should approach PR if they've really don't have a PR strategy in place. Well, it's the best advice I can give is it's easier than you think and I think a great. Tactic for e-commerce businesses are trying to land those digital media placement. So I wouldn't even consider print press it's really less relevant for an e-commerce business than ever you want those high quality links that are going to drive traffic and interest to your to your site. So you can use your products that you're selling to try to secure features on these digital Publications. Want to really go narrow rather than going Broad and trying to be everywhere and being overwhelmed by the volume of opportunities out there. It's you know, you get that feeling of overwhelm and then you just don't even take any action. So we want to cut back on the feeling of overwhelm by just choosing a few places that you think that your store and the products you carry would be such a solid fits. These are the places that you find yourself reading and you think to yourself we should really be featured here at this is such a perfect fit for what we're selling for what we offer in our store and then you want to kind of get into the mind of those editors that are writing those those features and try to think about a story angle or an approach for how you can propose your products and your store for those various features that they may. Working on moving forward so you can think about seasonal angles holiday pitches, you know, things like that and the good news about digital online Publications is that the lead time is actually pretty short so you don't have to be thinking too far out in the future. I mean, maybe four to six weeks or so if you have a new product launch, but with print magazines, it was always three or four months in advance. So, you know summertime you already thinking about holiday and. A little bit tricky to time it. So it digital, you know, they can publish their looking also for a lot of content they can publish quickly and that's good news for you. Is that rather than one print issue a month these Outlets are writing and constantly constantly producing content. So there's a ton of opportunity for you. And if you can get those high quality links right back to your site, then you're golden. Right right, and that's that's totally true, which he said is as far as the. Changing as far as being everything is digital. Now all of these editors and people that are producing these these different Publications or online Publications or online media Outlets, you know, they're they're they're hungry for content and they're hungry. Oh, yeah for advertising and so yes, if you're if you have the right, you know, if you're the right fit for them. Yeah, you can definitely get in so that that really makes total sense and our land sorry to cut you off, but that's the key what you said. Have the right fit you absolutely want to be sure when you are approaching these media Outlets that you've really looked at their content and you know that what you're presenting to them is a good fit for what they cover. We don't want to waste anyone's time and you don't want to just send a general pitch because it will get deleted it'll get ignored or worst. I mean you could even kind of get yourself blacklisted for not really paying attention to what they're covering. So just Taylor it and really. Presented in a way that shows you're paying attention your positioning your product and your store for their readership and their editorial focus. And that's where your pitches will convert right? Definitely. So yeah, you definitely have to do your homework, you know may take a little bit tough time. And I know when you're out there doing outreaches. I do a lot of the Outreach here at Omni Stars far as business development and you know, it can be tempting to take the easy route and just do a you know, put a blanket. All pitch out there to you know, just a lot of companies all at once but you know, if you just spend that little extra time digging into their site finding out what would be good for their their readership then and their viewership and that's that definitely will go go a lot further, you know in this whole online advertising media space one of the big buzz words that is always been constantly echoing around is influencers. So what do you think are some strategies? Is for connecting and engaging influencers to promote your brand. Oh, yes influencers. It's such a kind of knew. Well, the term influencer is new. I mean before that it was bloggers and you know, Mommy bloggers and other types of focused content creators online and now, you know, each social platform gives people that are great at creating content or. A certain position that they put out there that appeals to a certain demographic now, they're called influencers and what we're seeing in our space is actually different marketing tactics for different tiers of influencers. So the kind of main group that we've been hearing about for a while are called micro influencers and you know, it's hard to say exactly how many followers they have. But it's somewhere around 10,000 to about 50,000. So and one of the key things that is helpful with these micro influencers is that they have the swipe up functionality on Instagram. So if you have 10,000 followers are more they could do an insta story and then they could offer a swipe up functionality and Link directly to your product or your store. And so it makes them really appealing because they're not these kind of Mega influencers that have millions of. Followers which you know there they had agencies that represent them and they command Hefty price tags, you know some 10 12 20 thousand dollars per post. So that's really a significant barrier to entry for most. You know most brands and stores to work with those people. So the micro influencers actually really appealing because their content is generally really beautiful and very curated and you could look closely for these influencers that have the type of content that maybe matches your brand aesthetic or your store and your. Look and feel and also attracts the same Target customer not only is that influence or your Target customer? But the theory is that their followers would also be your Target customer and you want to look very closely at their actual engagement. So there's you know, these are businesses. These people are building their brands like a business and a lot of times there are games that they play and you know automating engagement and automating. Automating comments and likes and followers. What you want to try to look for is genuine engagement. So if you find someone that you think might be a great fit for you just kind of look around for a little while see when they post something do they get 5000 likes and five minutes and then it kind of levels out. You know, that means they're probably buying engagement and that are the comments All one or two words cool great shot you no, then it's pretty obvious that those comments are Bots or their automated. So just spend a little time and then you also want to look and see what other brands what other products they're also talking about because you don't want to be you know position next to your competitors or every if this person is only talking about products every single day, they might not be as genuine or appealing as somebody who is really. Fan a genuine fan of your your products the other the other kind of new newer influence or term we're hearing now. This is a new one. Even for me is the term is the term Nano influencer. And we even the past kind of call these people ambassadors, right? So they're the folks with about, you know, five hundred to five or ten thousand followers. Usually their sphere of influence are their friends and family and. The immediate circles around them that actually know them somewhat personally somehow they tend to have really good engagement and they are actually influential over their followers, even though it's a smaller group their engagements really high because. There's a personal connection there. So therefore their followers are actually listening to things they're recommending and it's really exciting to engage with these folks because you don't have to really pay them you can get a lot accomplished for product trade out. So we're seeing Big Brand some of my bigger, you know, the billion dollar brands are looking for these Ambassador armies and were able to engage with this this group with very high engagement and a lot of. For a pretty low cost, you know just for product exchange. So that's kind of you know, now it's nano. So if you here not work from micro to Nano. Yeah that that is a new a new term and that's actually kind of in my my room and a little bit in my my bread and butter space is of course with Omni star affiliate software. We provide a referral solution and the companies that utilize our software get Affiliates or they can also be considered him back. There's so those ambassadors. If you will kind of would fit the category of those Nano influencers where they're getting some type of commission it in exchange for doing their promotion across their their social channels. So that commission could be product or it could be money. It could be, you know, whatever the company decides and so the barrier to entry for obtaining those people is a lot lower than you know, when people hear influencers, they immediately A lot of people don't really realize and I'm glad you broke it down. To the micro influencers because that's you know, if you don't look at it like that your you would be leaving a lot of you know things on the table that you hadn't really even considered because I think when people think of influencers and hear that term, they immediately think of the Kim Kardashian's and the yeah the whole Kardashian family and I can't get an influencer, you know, there's nowhere in my my realm of influence but there are those micro influencers and now the these Nano influencers that the do exist the I actually gave. I actually gave a webinar few weeks ago and I talked about micro influencers and I did a comparison a woman she promotes on she's considered a micro influencer and she promotes for a lot of the athletic wear the Adidas and things like that. And you know, she has probably about 20,000 followers and things like that. And what I was showing was it's all it'll be a lot easier to approach her and to try to get some type of Engagement with her as opposed to you know, Kim Kardashian's. And people at that level and you know, even though she just has to be so 20,000 or so followers on Instagram. That's you know, if that's an audience that really is your particular demographic then that's you know, that's that's really nothing to really sneeze that that's that's still something that can come move the needle if she's putting your products in front of her her audience. So yeah and another. Yeah, definitely. It's such a great strategy and one of the side benefits of it is that they're creating really beautiful content that you can repurpose for your own social feeds and you know, so it's important to look at their aesthetic and make sure that the quality and the kind of look and feel really matches your Brand's aesthetic but that's a great tactic and you know, you can certainly reach a lot more influencers if you focus on the kind of micro tear right and go. Out sure for definitely for sure now, you know, I've been in the in the internet game for quite a long time and I do recall when we kind of initially got started at Omni star. We had a variety of different web-based solutions and one of our strategies and you can kind of tell me how it is today, but one of our strategies was doing press releases. We put out several different new versions of our different Web Solutions, and we did press releases. We use some of the online press release sites. And put it out there, you know today. I don't know how effective it was back then but my question is today space with social media are how effective our press releases on are they still is that even something a business and e-commerce business should even consider doing if they let's say have a an announcement on new product line or what have you. Press releases. Do not really generate any editorial features. So in terms of trying to drum up media attention, it has absolutely zero impact and back in the day, like what you're describing. The press release was kind of used almost for an SEO purpose. And now I mean, it's been many many years, but the Google and other search engines their algorithms are not weighing press releases. All because they realize that companies were just putting out whatever information they wanted to, you know rank high for certain keywords or things like that. So it was an actual news. It was really just a search engine SEO tactic. So press releases don't do a whole lot but what they can do and are you know, some of our clients still want to release them on PR web and PR newswire is they want to kind of control the conversation around. A certain topic as it relates to their brand so, you know rather than pushing their side up in a search for SEO purposes or trying to generate other media features. They'll just have a press release available and searchable. So if someone is looking for certain keywords, or you know, they're announcing a partnership or like you said a new product launch, at least they'll be able to find some. Solid information that the brand is, you know controlling so we tend to not even really write press releases anymore. We're really just writing targeted strategic pitches and usually that starts as like a solid core content that could be translated across a number of different media Outlets. So it's like the same information you're using over and over again, but then the hook or the angle or the sipc for the story. Around those key details will change depending on who were pitching. So that's what editors are looking for. More of these days is not so much a press release if your pitch has all of the information then you know, they'll consider it for a feature which is way more strategic and targeted than just blanketing a press release which really has no impact anymore. That's what I that's kind of what I thought. I don't see them use too much at all and I. Yeah, who's wondering, you know, you know, what is it did it was it effective at all? I mean occasionally I'll see them but yeah, I think that's kind of what I figured as far as the search engines are concerned. I think back in the day companies were kind of taking advantage of Google's looser algorithm algorithm and just kind of yeah being a little spammy. I guess if you if if you will and just trying to get out there via that route, but yeah these days you can't. They've tightened things up a little bit so I don't think oh, yeah, I can't really do that too much these days. Now I know with your company and I mentioned in the intro you of course, you've worked with a variety of different brands and even some billion dollar Brands and you mentioned of course, it's companies that of course have you on a retainer which I know is is typical for dealing with a PR firm. But what about businesses that that really can't afford to keep a PR for firm on retainer. What are some tips that you can. Provide as far as some basic PR tips that they can do if they don't quite have a budget for a PR firm. Yeah, and like I said earlier, it's totally doable on your own. It's easier than you think, you know, it's really kind of keeping up with where you believe your Target customers are hanging out, you know, are they on certain websites reading things are they kind of engaging with certain influencers, you know, you got to kind of start with a plan so. Again, it's about eliminating overwhelm and having a very small but solid strategy so you can actually take action and move forward. But once you kind of figure out, you know, it's that when you get struck with that feeling of oh my God, you know, we really could be featured here. Why don't they talk about my products? This is such a perfect fit for what we offer start to write those down and they could be the you know, whatever Outlets you're feeling that way about when I say Outlets. I need websites, you know your. Influencers feeds on social media start to take note of all of these things and start it'll start to build a foundation. What a good media strut media outreach strategy is for you and then you're going to want to kind of look for a little while like you said and do some reach research and see what they're writing about. What kind of features do they have regularly and could your products could your store fit in with those regular features or what holidays are coming up? What's seasonal Trends? Can you talk about that your store would be a great fit for a feature or a story about that seasonal Trends, you know, if it's a Halloween store, you can talk about the the hottest costumes of the Season or you know, just thinking about what they're likely to. Writing about your getting in their heads a little bit and you know, it's almost kind of mirrors what your marketing promotions are doing to so if you have certain sales coming up for certain holidays chances are editors are probably writing about those holidays or those Seasons or those Trends also, so try to fit into those and be very targeted and when you're reaching out you can usually find someone's contact information on the website and just. And as very brief pitch, you don't have to give them the entire angle. Give them a solid call to action. What is the next step? You want them to take after reading your email? What can they do to move forward with you? Do you want to offer a product sample? Do you want to offer them more images that they can consider running? Do you want to give them an interview with the store founder to give them some tips and trends that they can talk about related to that holiday. What are. Offering so give a very solid call to action at the end of the email and keep it short and brief and that's the type of pitch that will convert and if you don't hear anything right away send a follow-up and send it to other follow-up because we even as agency owners we get most of our pitches converting on the follow-up so don't give up. Right right. That's that's some great advice and I like what you said at the end there about the about the follow-up because that's so true and I think. A business that are the key takeaways from what you said is if these things can be done. Yeah, I mean you can really formulate your own PR strategy and house. You don't have to necessarily hire a PR firm, you know on retainer and of course unless you have the budget to do that unless your growth dictates that you should do that that yeah, it makes sense. But you know, if you're just starting out a lot of these things can be done in house and you just have to set aside the time and be consistent with it. And I think as far as the Outreach is concerned the. Thing with the Outreach that I see from my own experience is the follow-up is really the main thing and you have to make sure you've got good CRM solution some type of follow-up solution that will help you easily track all of your correspondence. So, you know, and there's a lot of automated systems out there. We actually use a system here in house to do a lot of our Outreach. It's called Lynn list. It helps us do our cold Outreach where you can kind of feed in a bunch of Outreach templates and it'll basically. The we'll just kind of go you just feed it emails and you set a schedule for when you want the first female to go out when you want the second one and of course, it'll stop if you if you get a response. So there's a lot of solutions like that but that's one solution that we've used a lot of them. And that's one that we've had a lot of success with so you have to keep in mind that all of these outlets and media Outlets that you're reaching out to. They're getting pitch left and right daily. And so oh, yeah, you not good entrepreneurs that are listening shouldn't be surprised that you know, they're not going to get a response in the first email. That's that's typical. They may have to send two three four five emails before they hear anything. But the key thing is making sure you do the follow-up and you track it. And you know, if you do get any correspondence back where you find out who you should direct your inquiry to make sure you track that you log it so that you know where to go on, you know future follow-ups. So yeah, that's a think overall, you know, it's a great piece of advice that you gave therefore for businesses. Yeah, everything that you mentioned. Jen is been very. I'm powering. I know for the listeners that have been listening. I hadn't really touched on PR before and all while I've been the host of the Commerce Park marketing podcast. So I think your Insight is very invaluable to our listeners and I'm glad we're able to touch on it today. But before we close things out, I always like to end now in a kind of a switch gears here. Just a closing. Fun fact question. What's what's one thing that our audience would be surprised to know about you. This is such a. Question. I'm actually sitting in my home office, which was designed by HGTV. Okay. Yeah, it was so awesome. My husband and I were on a show. It was quite a few years back, but the show was called HGTV. For HGTV super fans, which is and they did such an incredible job. I mean it was such a really really cool awesome experience, but I feel so just lucky and inspired every day to work and I'm like looking around the room as I'm saying this I just feel so inspired every day to be in this space and it's so cool and the experience of being on the show was great and. I love everything they picked and it just felt so special to be you know, on one of the shows that I love and watch all the time. And now, you know, even it's been 8 years. I still just absolutely love love love my space and everything they did in it. So that was. Whole thing, I got to do. Yeah, that's that's awesome. Yeah, I'm a fan of a lot of those HGTV shows as well and I've seen a lot of them where they do the the renovations and the makeovers and that's that's an awesome opportunity because I know you know, there's tons of people that right into those shows and they got to do a thorough screening process. So you're very fortunate to have been selected. And so yeah, that's that's awesome. So well Jen, if you know any of our listeners want to get in touch with you or reach you what's what's the best way for them? To do it. You can check out our website. It's generation PR.com and that's spelled with a DJ for Jen and all of my social media handles are also at generation PR with the J. Okay, great. That is awesome. 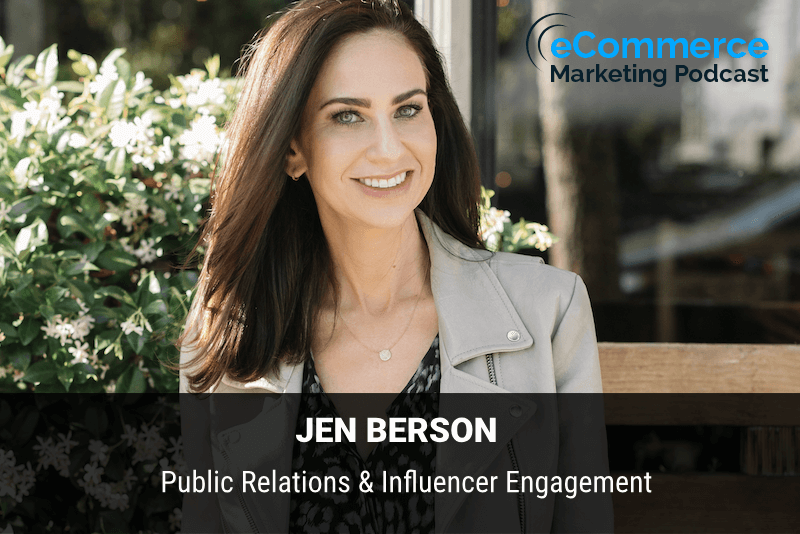 Well, thanks again Jen for being on the e-commerce marketing podcast. We appreciate all your Insight, and I know it's going to go a long way for with our listeners. Awesome. Thanks so much. Thank you. Thank you for listening to the e-commerce marketing podcast. You need to get more feedback and reviews from your customers and improve your customer retention. Jen is also the creator of Press Success, a PR Master Class for entrepreneurs to learn the step-by-step framework for executing a PR strategy that converts into massive media placements for their businesses, and the Agency Accelerator, where she teaches the exact strategy to launch, grow & scale a profitable PR & marketing Agency in just 8 weeks.. Prior to founding Jeneration PR in 2005, Jennifer was a lawyer and practiced civil litigation at a prestigious law firm. Then, she “saw the light” and left to start her own business and pursue more creative endeavors (and she’s never looked back!). Jennifer has been featured in the New York Times, Forbes, Inc.com, Business Insider, the Huffington Post and many other well know online media outlets. Welcome to the podcast Jen!